One of our most popular parent education topics is “Montessori in the home”. I think it’s wonderful that there’s a desire for consistency between home and school. Parents are very curious as to what their child is doing in the classroom, but more importantly, parents want to know what they can be doing in their home environment to continue to help their child thrive. Consistency is key! Montessori is a wonderful concept that can easily be incorporated into any home setting. Focus on your child’s independence above all else. Do they have everything they need to succeed independently? For example, can they choose their own clothing in the morning, is there a stool in the bathroom so they can brush their teeth or wash their hands on their own, do you have an area of the kitchen set aside for them to grab eating utensils or a drink of water whenever they feel thirsty or hungry, do they have works and activities that stimulate their senses while strengthening their concentration and inner motivation? 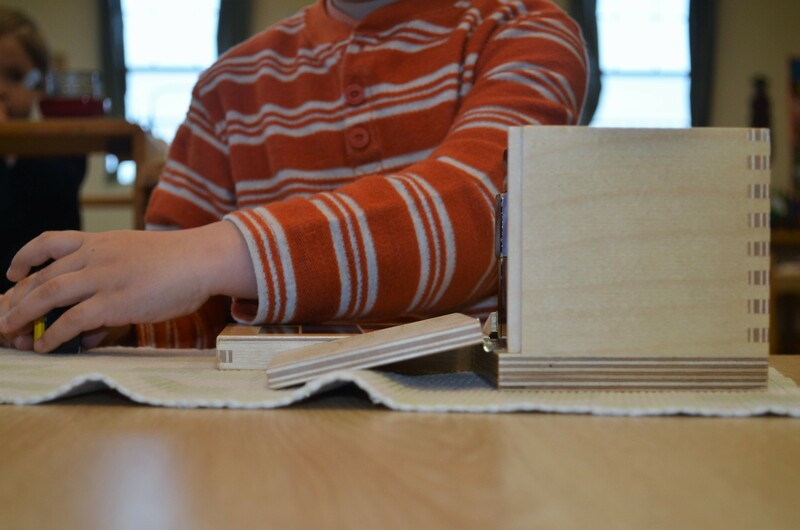 There are several factors to consider while implementing Montessori in the home. Let’s take a look at a few of them. Children have a great need for order and routine. The child’s sense of order is similar to a child’s thirst for water, or hunger for food. A child cannot succeed until there is order in their life. E.M. Standing said that “everything in [the child’s] environment should be kept in its accustomed place; and that the actions of the day should be carried out in their accustomed routine.” (Maria Montessori: Her Life and Work) It’s really no different than us adults needing routine in our life. When a child knows their routine, and can predict what’s going to happen next, they’re able to be more independent. 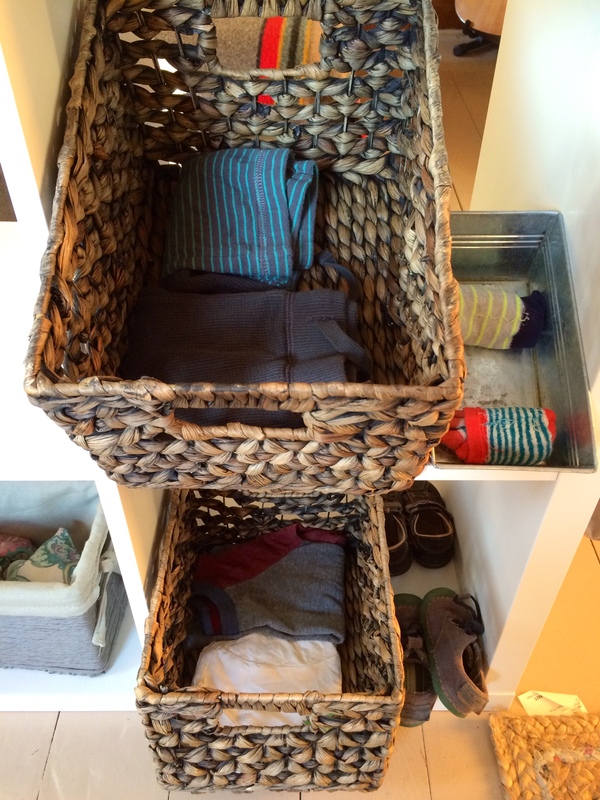 Place a few baskets in their closet, filled with clothes for the day so they can easily put them on, on their own. Offer choices as to what they would like to eat for breakfast, encourage them to help prepare the food. 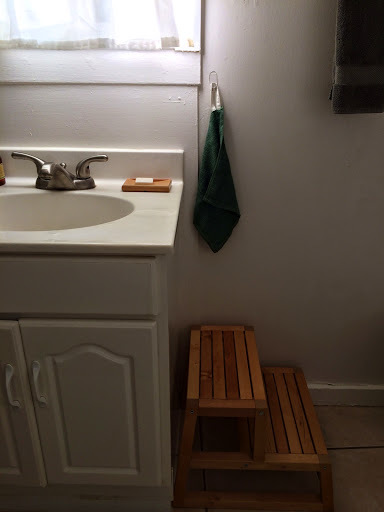 Place objects around the house to help them easily access the things they need (for instance, a stool in the bathroom to help them reach the sink). Transitions are part of the child’s routine. Explain everything that you’re going to do, before you actually do them. This will help your child know the expectations, and not be surprised at the sudden change of activities. Children want to have responsibility; to feel needed in their home environment. How much responsibility does your child have throughout their daily routine? Encourage your child to make their bed every day, put dirty clothes in the hamper, fold/put away clean clothes, feed pets, put away toys or works after each use, help set the table for meals and clean up dishes afterwards, sweep/mop/vacuum floors, and so forth. These responsibilities don’t just come at a certain age, they can be provided as soon as your child shows an interest, or “readiness” to help around the house. Model for your child how to carry out each task, and share in their enjoyment once complete. Grace and courtesy is a major component of our Montessori environment. Grace and courtesy lessons give the child the vocabulary, actions, and steps required for him to build his awareness and responsiveness to those around him. When we sneeze, we cover our mouths. When we have a runny nose, we use a tissue and throw it away afterwards. We say “excuse me” when walking around others who might be in our way. We say “thank you” when a friend helps. We know not to interrupt a guide during a lesson, but to wait patiently instead. The same practice can be done so at home. If you wish for your child to say “please” and “thank you”, you must do the same. You can provide activities to help your child learn grace and courtesy. For instance, practice setting the table. Ask your child to help bring a few dishes, napkins, silverware, etc. to the table, remember to say please and thank you after each exchange. Practice different scenarios where your child would need to use grace and courtesy to achieve the end result. Our children are constantly tidying up after one another. When we spill water, we clean it up. We wash our own dishes after meal times. We clean the tables and chairs whenever needed. We care for plants through watering the soil and polishing the leaves. 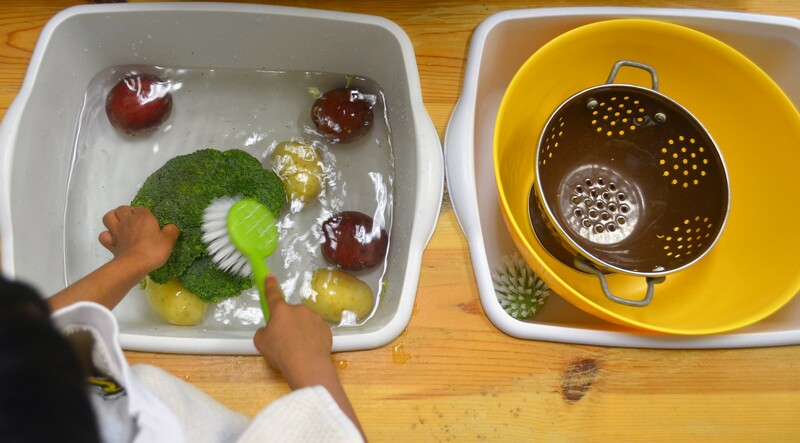 Often times, you might see a whole classroom full of toddlers cleaning or doing “practical life” works. This is very normal. Through care of environment, the child learns self control, scope and sequence, control of error, discipline, focus, and so much more. You can encourage your child to do the same at home. Allow them to tidy up after themselves. Remind them to put away works when they’re through. Clean the table after mealtime. 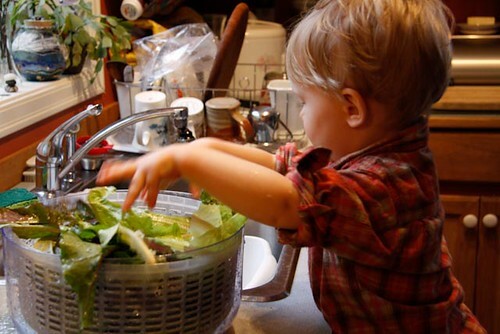 If you have a garden, allow your child to help water and harvest. Encourage them to help bathe themselves during bath time, brush their hair, teeth, and so forth. 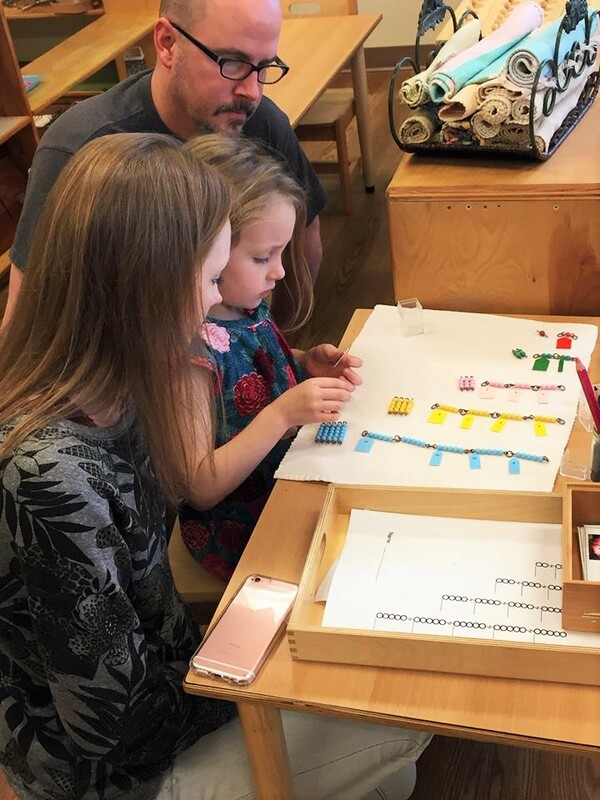 There are so many other things that you as a parent can do to help your child succeed, while implementing Montessori in the home. Practicing Montessori in your home is a beautiful gift that you can give to your child. By doing so, you’re allowing your child the opportunity to grow and flourish successfully in an environment prepared specifically for them. When infants first interact with the world, they don’t have words to describe what they encounter, so they absorb their surroundings and new information through their senses. They experience the external world through the use of their senses. Our eyes help us see, our ears let us hear, our hands help us feel, our noses let us smell, and our tongues help us taste. Children are spontaneous learners. Every day is a new opportunity for a child to learn. 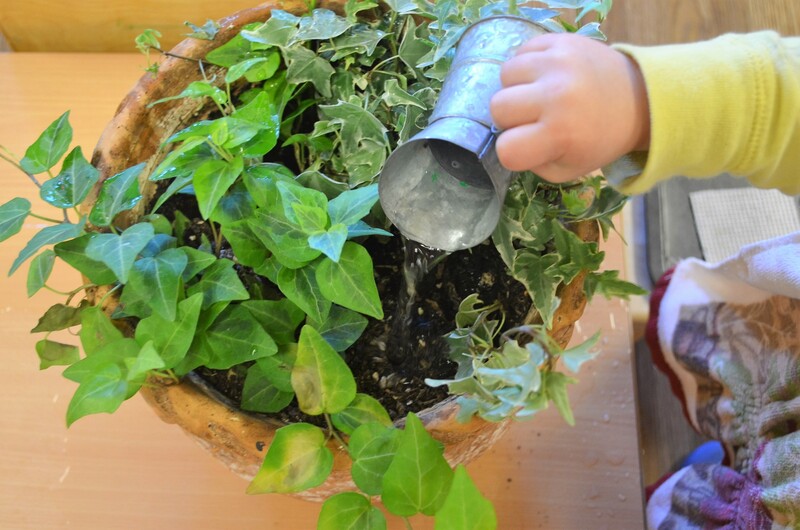 You can use almost anything surrounding you to help stimulate a child’s senses. Begin by experimenting with different smells, watch their expressive language for likes and dislikes. 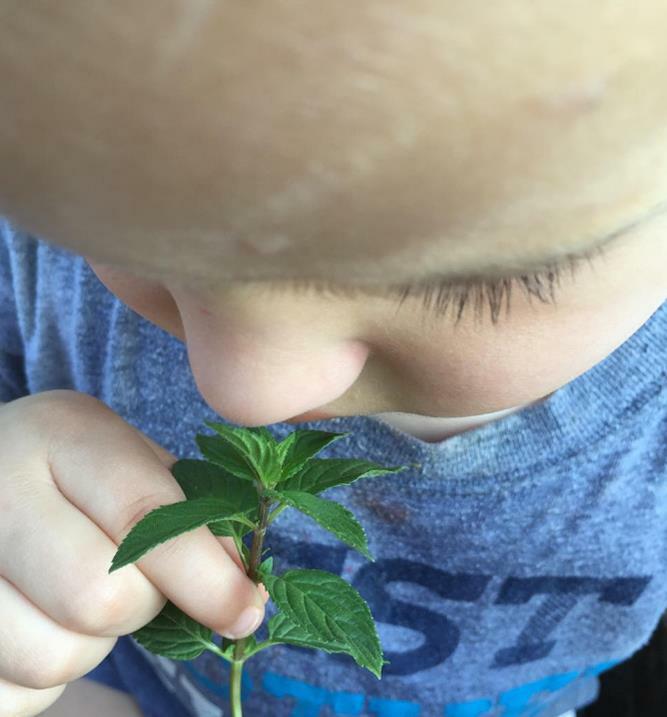 Visit a park, find nature objects to touch, taste, smell, using language to describe what you’re experimenting with. Children respond differently to sensory experiences. These experiences can greatly improve their motor skills, raise awareness of the world around them, and contribute to language acquisition. They can also be quite therapeutic. Enhancing and building upon the child’s senses helps improve their social, emotional, cognitive, physical and language development. 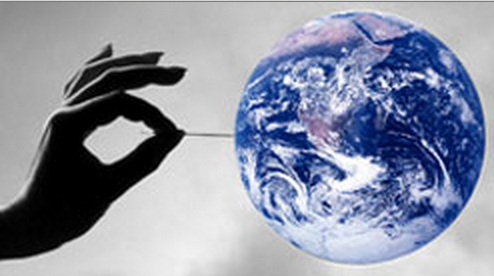 “At what point do you burst the Montessori bubble?” a friend recently asked. She has two young children in Montessori, but is considering enrolling them in a traditional private school after they finish Primary. My first thought (as a Montessori child, parent, and teacher) was, Why would you want to burst it? Why leave Montessori if you don’t have to? But my friend is not alone in her concern: many parents feel that Montessori shelters children from tests, grades, and competition. Based on their own background, they believe that only a conventional approach to education can provide the tough experiences that will prepare children to be successful when faced with the hardships of real life. His question was all the answer I needed. Because the truth is, success in life is not built on a foundation of standardized tests, but on the freedom to make difficult choices and experience their consequences. Success in life is not built on grades and percentages, but on self-awareness and self-improvement. Success in life is not built on artificial competition among same-aged peers, but on genuine collaboration between generations. Success in life is not built on cheating the system, but on having the wisdom and courage to transform it. 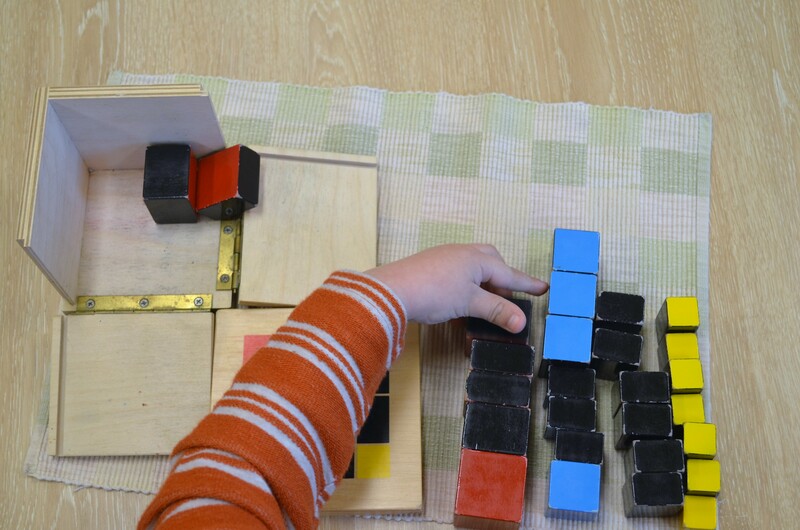 One of our favorite blogs to follow (and one that gives us lots of inspiration) is How We Montessori. They recently posted a beautiful article describing the proper layout of a Montessori Infant home environment. Check it out! Are you expecting a baby or setting up a Montessori infant room? Here are a few ideas and suggestions for the environment for a 3-6-month-old child. 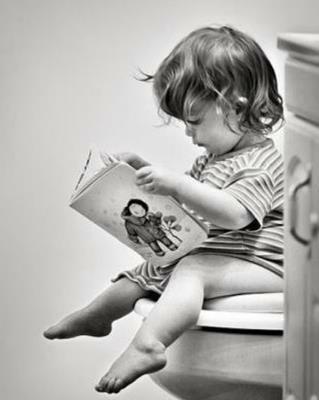 The child is in the period of the absorbent mind. They are absorbing and getting impressions from everything in their environment. We want their room to be ordered, to be clean, safe and beautiful. The child is beginning to do intentional and coordinated work with their hands and possibly hand to hand transfer. They are observing their hands coming together. Reaching out and grasping is a big part of their work. They are ready for the sensory, tactile experiences of various fabrics, rattles and balls. Rattles allow the child to experience the physical sensation of holding something in their hands; they allow the child to grasp, to let go, to shake and feel cause and effect. This is important for the developing human intelligence including myelination, and activation of the muscles of the arm, hand and fingers. The child is beginning to move and slither, or commando crawl. They need the opportunity to move (freedom of movement), to reach a toy or to get to the other side of the room (being able to see and access their materials/toys on the low shelving). The child has greater control of their body and observing movement (wall mirror) is important. The child has greater control of their head and can look around to observe their surroundings. They begin to visually map their room. They can look up and see the materials on the shelf and artwork on the walls. The child is developing spatial awareness and features such as an unobstructed view (floor bed) and being able to see their entire room can assist with this. Floor bed, board books (or fabric or other suitable books), low shelving, developmentally appropriate materials and toys, low hanging artwork, low chair, movement mat or play area, wall mirror, tactile mobiles (for batting or grasping). Today, we’re going to highlight on one of our students’ favorite works; the trinomial cube. There’s real beauty behind the intricate details of this mathematical work, details that are hard to notice at first glance. The direct aim of this work is rather obvious; to build a puzzle in a box. The indirect aim, an introduction to algebra and preparation for the formula a+b+c³. While there are many hidden lessons in this puzzle, the child is actively working towards building a concrete foundation for the abstract nature of the formulation, which they will later expand upon. The puzzle helps the child grasp the concept of a+b+c³ at such a young age, rather than simply memorizing the formula. 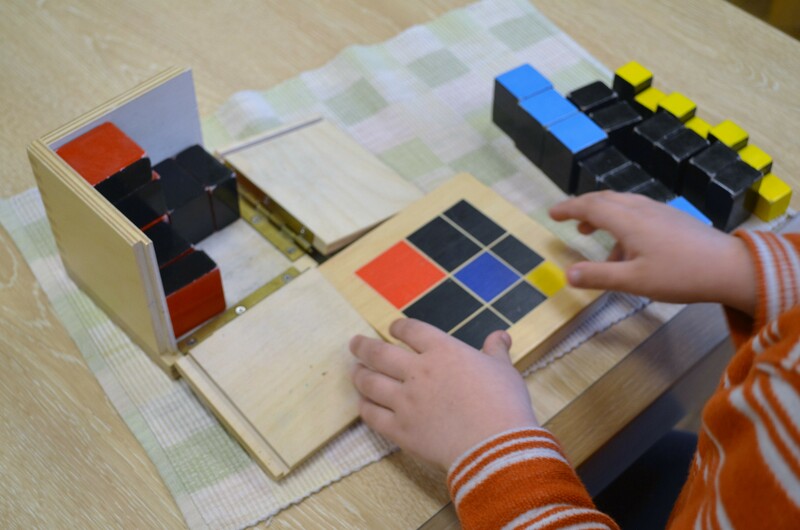 Through the child’s discovery, they come to unlock the intricate layers of the trinomial cube. To begin, the guide carefully opens the box, and lays out all of the pieces, organizing them in different manners. With little, to no words, she places the cubes upon the lid, pairing the colors to one another. Each layer is placed in the box upon completion. The child is then invited to do the work on their own. There are many variations of the trinomial cube that call upon the child’s creativity, imagination and critical thinking. We had a great turn out for last night’s Discovery Session, “See. Experience. Believe. Third-Year Montessori.” Families from all our classrooms came to witness our senior primary students presenting lessons in the classroom. Our friends were very excited to display works that they’ve been practicing for many months now! This was truly an enlightening, informative night! One of our friends showing the short chain of 1-5 to her parents. The beads allow the child to visually see number quantities, and skip count (3…6…9…and so forth). This is an important step in learning enumeration; a lesson that is taught all throughout their three-year primary cycle. It was so neat to witness our young friend teach her mom and dad this special lesson! Everything the child learns as a young infant, prepares them for works such as this. When they first enter the primary community at age 3, they’re given the opportunity to explore and discover their new community. The second year is a time of solidification, further refining these new-found skills. And the third year (5-6 years old) is a time for application. Each lesson builds upon itself, ultimately preparing the child for the last year in our primary community. I practiced for such a long time on the Map of Europe. My muscle memory allowed me to do the entire puzzle off the board, and without a control chart. I was so happy to include my mom and dad in this work! Thank you, parents, for supporting your young ones, and being a big part of their educational development! Consistency is key when it comes to your child’s learning environment at school and home. 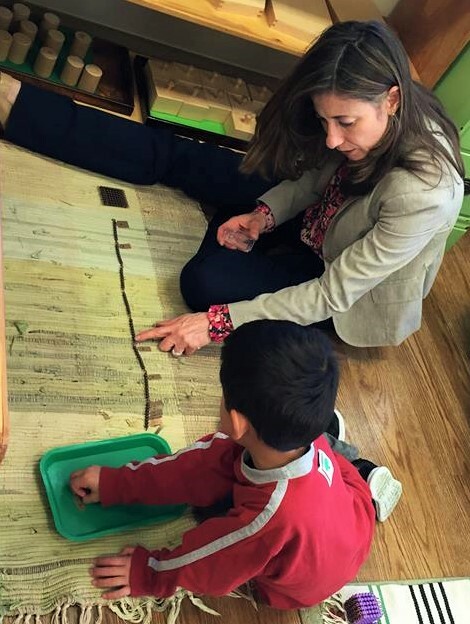 Creating a Montessori-friendly environment at home is easier to attain than you may think. Just keep a few things in mind, 1) is my child able to fulfill their needs independently, 2) can they reach necessary objects that are placed away in a cabinet/shelf, 3) are they given quiet areas to work/play independently, 4) are these areas tidy, neat and uncluttered. Purchasing Montessori materials can be intimidating to some, however rest assured that many of these works can actually be hand-made with materials found around the house. This blog I came across, Kavanaugh Report showcases beautiful pictures of how to incorporate Montessori in your home and the furniture layout of each appropriate area. How can I help Prepare my Child for their Toddler Transition? Many of our students are fast approaching the age to start preparation for the transition from the Infant Nido Community to the Toddler Community. This is a very important time in their development, as they go from being the leaders in the Infant Room, to being some of the youngest students in a completely new, toddler room. They’ve spent their entire life in the Infant community; this is a big change for them! 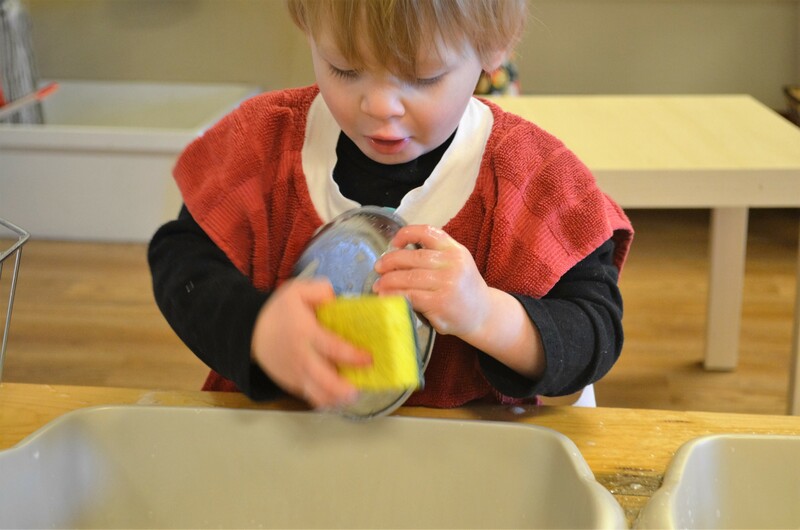 Our goal, and the beauty in the Montessori philosophy, is to establish consistency between the child’s home and school environment, especially during this transition. 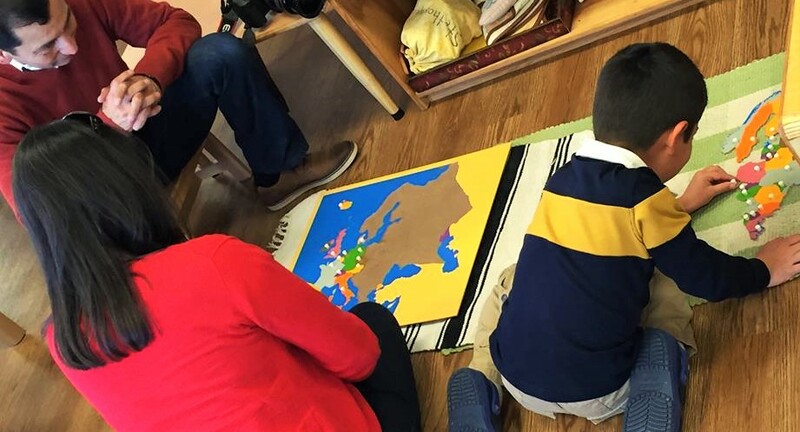 It’s important to try to prepare a Montessori environment at home, including all “things” that a child will need, use, wear and be exposed to within their immediate environments. This approach can make everyday tasks and these ‘transitions’ as your child grows, smoother and easier for children and adults alike. What Can I do at Home to prepare my Child for their Toddler Transition? 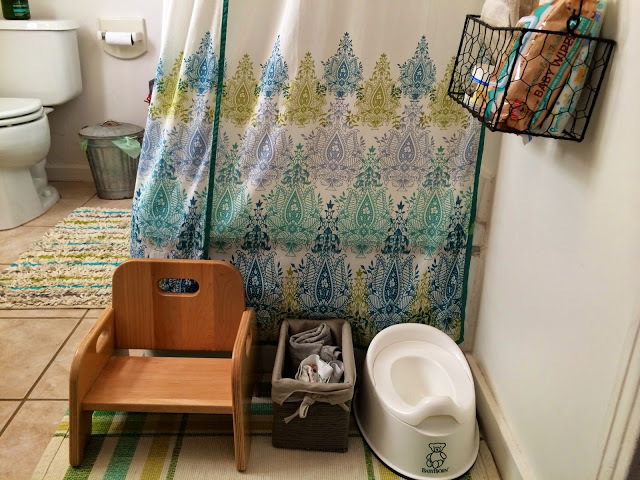 According to the AMI Montessori guidelines for ages 0-3 and setting up the environment, adults can purchase a potty and keep it stored next to the diaper changing area as soon as the infant nursery is set up; thus making the toilet an everyday household fixture that “has always existed” in the child’s reality. In contrast and in most instances, the potty is suddenly purchased and appears in the child’s reality around age 2 whenever the adults decide they are ready to begin the toilet learning process. I choose a Montessori school for my son almost as an act of faith. At that time my knowledge of the method was null, besides having heard of small chairs and colored beads. 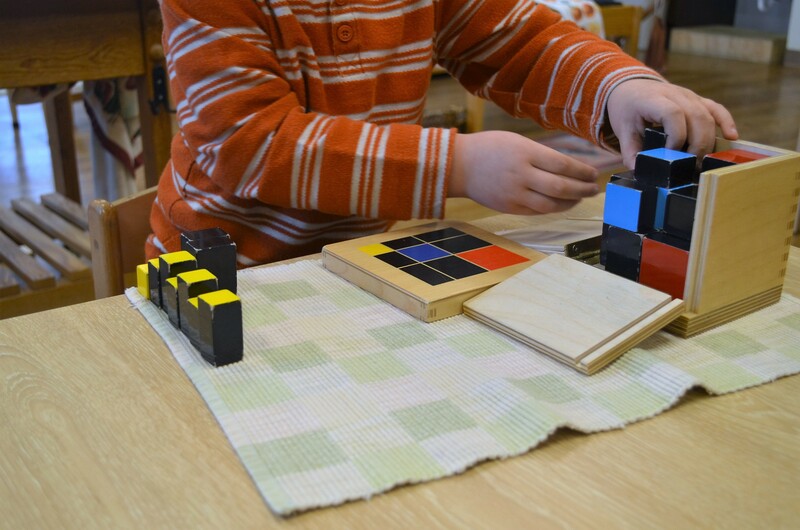 But seeing my son happy day after day encouraged me to study and deepen the Montessori’s ideas. What I had discovered astonished me as a father and as a scientist. As a father, I found how children are really respected and prepared for the future. As a scientist, I found solid scientific foundations for everything Maria Montessori proposed.